"Federal Convention" redirects here. For other uses, see Federal Convention (disambiguation). The Constitutional Convention:31 (also known as the Philadelphia Convention,:31 the Federal Convention,:31 or the Grand Convention at Philadelphia) took place from May 25 to September 17, 1787, in the old Pennsylvania State House (later known as Independence Hall because of the adoption of the Declaration of Independence there eleven years before) in Philadelphia. Although the Convention was intended to revise the league of states and first system of government under the Articles of Confederation, the intention from the outset of many of its proponents, chief among them James Madison of Virginia and Alexander Hamilton of New York, was to create a new government rather than fix the existing one. The delegates elected George Washington of Virginia, former commanding general of the Continental Army in the late American Revolutionary War (1775–1783) and proponent of a stronger national government, to preside over the Convention. 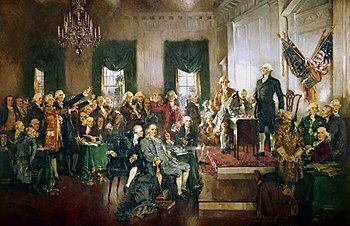 The result of the Convention was the creation of the Constitution of the United States, placing the Convention among the most significant events in American history. At the time, the convention was not referred to as a "Constitutional" convention, nor did most of the delegates arrive intending to draft a new constitution. Many assumed that the purpose of the convention was to discuss and draft improvements to the existing Articles of Confederation, and would have not agreed to participate otherwise. Once the Convention began, however, most of the delegates – though not all – came to agree in general terms that the goal would be a new system of government, not simply a revised version of the Articles of Confederation. Several broad outlines were proposed and debated, most notably James Madison's Virginia Plan and William Paterson's New Jersey Plan. The Virginia Plan was selected as the basis for the new government, but several issues delayed further progress and put the success of the Convention in doubt. The most contentious disputes revolved around composition and election of the upper legislative house in the future bicameral Congress, to be known as the Senate, how "proportional representation" was to be defined (whether to include slaves or property), whether to divide the executive power between three persons or invest the power into a single chief executive to be called the President, how to elect the President, how long his term was to be and whether he could run for reelection, what offenses should be impeachable, the nature of a fugitive slave clause, whether to allow the abolition of the slave trade, and whether judges should be chosen by the legislature or executive. Most of the time during the Convention was spent on deciding these issues; the concept of a federal government with three branches (legislative, executive, and judicial) and the general role of each branch was not heavily disputed. Progress was slow until mid-July, when the Connecticut Compromise resolved enough lingering arguments for a draft written by the Committee of Detail to gain acceptance. Though more modifications and compromises were made over the following weeks, most of the rough draft remained in place and can be found in the finished version of the Constitution. After several more issues were resolved, the Committee on Style produced the final version in early September. It was voted on by the delegates, inscribed on parchment with engraving for printing, and signed by thirty-nine of fifty-five delegates on September 17, 1787. The completed proposed Constitution was then released to the public to begin the debate and ratification process. Before the Constitution was drafted, the nearly 4 million inhabitants of the 13 newly independent states were governed under the Articles of Confederation and Perpetual Union, created by the Second Continental Congress, first proposed in 1776, adopted by the Second Continental Congress in 1778 and only finally unanimously ratified by the Original Thirteen States by 1781. It soon became evident to nearly all that the chronically underfunded Confederation government, as originally organized, was inadequate for managing the various conflicts that arose among the states. :4–5:14–16 As the Articles of Confederation could only be amended by unanimous vote of the states, any state had effective veto power over any proposed change. In addition, the Articles gave the weak federal government no taxing power: it was wholly dependent on the states for its money, and had no power to force delinquent states to pay. Another impetus for the convention was Shays' Rebellion of 1786-1787. A political conflict between Boston merchants and rural farmers over issues including tax debts had broken out into an open rebellion. This rebellion was led by a former Revolutionary War captain, Daniel Shays, a small farmer with tax debts, who had never received payment for his service in the Continental Army. The rebellion took months for Massachusetts to put down completely, and some desired a federal army that would be able to put down such insurrections. These and other issues greatly worried many of the Founders that the Union as it existed up to that point was in danger of breaking apart, and being subject to the persuasion of foreign powers. In September 1786, at the Annapolis Convention, delegates from five states called for a Constitutional Convention in order to discuss possible improvements to the Articles of Confederation. The subsequent Constitutional Convention took place in Philadelphia, convening in the Old Pennsylvania State House (then becoming known as Independence Hall) on May 14, 1787. Rhode Island, fearing that the Convention would work to its disadvantage, boycotted the Convention and, when the Constitution was put to the states during the next year of controversial debates, initially refused to ratify it, waiting until May 1790 to become the thirteenth state, a year after the new federal government commenced. Due to the difficulty of travel in the late 18th century, very few of the selected delegates were present on the designated day of May 14, 1787; it was not until May 25 that a quorum of seven states was secured. New Hampshire delegates would not join the Convention until more than halfway through the proceedings, on July 23.:103 James Madison arrived first, and soon most of the Virginia delegation arrived. While waiting for the other delegates, the Virginia delegation produced the Virginia Plan, which was designed and written by James Madison. On May 25, the delegations convened in the Pennsylvania State House. George Washington was unanimously elected president of the Convention, and it was agreed that the discussions and votes would be kept secret until the conclusion of the meeting. :11 Despite the sweltering summer heat, the windows of the meeting hall were nailed shut to keep the proceedings a secret from the public. [History Alive! 1] Although William Jackson was elected as secretary, his records were brief and included very little detail. Madison's Notes of Debates in the Federal Convention of 1787, supplemented by the notes of Robert Yates, remain the most complete record of the Convention. :162–64 Throughout the debate, delegates constantly referred to precedents from history in support of their position. Most commonly, they referred to the history of England, in particular the Glorious Revolution (often simply called "The Revolution"), classical history (mainly the Roman Republic and the leagues of Greek city-states), and recent precedents from Holland and Germany. Outside the Convention in Philadelphia, there was a national convening of the Society of the Cincinnati. Washington was said to be embarrassed. The 1776 "old republican" delegates like Elbridge Gerry (MA) found anything military or hereditary anathema. The Presbyterian Synod of Philadelphia and New York convention was meeting to redefine its Confession, dropping the faith requirement for civil authority to prohibit false worship. Protestant Episcopalian Washington attended a Roman Catholic Mass and dinner. Revolution veteran Jonas Phillips, of the Mikveh Israel Synagogue, petitioned the Convention to avoid a national oath including belief in both Old and New Testaments. Merchants of Providence, Rhode Island, petitioned for consideration, though their Assembly had not sent a delegation. Manasseh Cutler came directly from the capital in New York and found himself a frequent dinner guest among the delegates. He carried grants of five million acres to parcel out among The Ohio Company and "speculators", including some who were attending the Convention. [a] A Philadelphia guest of Robert Morris, Noah Webster would write a pamphlet immediately after the signing. "Leading Principles of the Federal Convention" advocated adoption of the Constitution. It was published much earlier and more widely circulated than today's better known Federalist Papers. The Convention agreed on several principles. Most importantly, they agreed that the Convention should go beyond its mandate merely to amend the Articles of Confederation, and instead should produce a new constitution outright. While some delegates thought this illegal, the Articles of Confederation were closer to a treaty between sovereign states than they were to a national constitution, so the genuine legal problems were limited. :64 Another principle they agreed on was that the new government would have all the powers of the Confederation Congress, plus additional powers over the states. :64 Once agreeing on these principles, the Convention voted on the Virginia plan and signaled their approval for it. Once this was done, they began modifying it. Madison's plan operated on several assumptions that were not seriously challenged. During the deliberations, few raised serious objections to the planned bicameral congress, nor the separate executive function, nor the separate judicial function. :67 As English law had typically recognized government as having two separate functions, law making embodied in the legislature, and law executing embodied in the king and his courts, the division of the legislature from the executive and judiciary was a natural and uncontested point. In England, at this day, if elections were open to all classes of people, the property of landed proprietors would be insecure. An agrarian law would soon take place. If these observations be just, our government ought to secure the permanent interests of the country against innovation. Landholders ought to have a share in the government, to support these invaluable interests, and to balance and check the other. They ought to be so constituted as to protect the minority of the opulent against the majority. The Senate, therefore, ought to be this body; and to answer these purposes, they ought to have permanency and stability. On Thursday, June 7, it was proposed that senators should be chosen directly by the state legislatures, instead of by popular vote, as this method was more likely to preserve the power of the upper classes. Convention delegate Elbridge Gerry of Massachusetts observed that "the great mercantile interest and of stockholders, is not provided for in any mode of election-they will however be better represented if the State legislatures choose the second branch." The proposal was carried unanimously. The delegates also agreed with Madison that the executive function had to be independent of the legislature. In their aversion to kingly power, American legislatures had created state governments where the executive was beholden to the legislature, and by the late 1780s this was widely seen as being a source of paralysis. :82 The Confederation government was the ultimate example of this. In a few areas, Madison's plan included provisions that had little support among the delegates. Few agreed with Madison that the legislature should be able to invalidate state laws, so the idea was dropped. While most thought there should be some mechanism to invalidate bad laws by congress, few agreed with Madison that a board of the executive and judges should decide on this. Instead, the power was given solely to the executive in the form of the veto. Many also thought this would be useful to protect the executive, whom many worried might become beholden to an imperial legislature. :141 Also, during the deliberations, the New Jersey Plan was introduced, although it was more of a protest to the excessive national character of the Virginia plan, and was not seriously considered. :230 The office of Vice President was also included later in the deliberations, mainly to provide the president a successor if he was unable to complete his term but also to provide presidential electors with an incentive to vote for at least one out of state candidate in addition to a "favorite son" from their own state or region. All communities divide themselves into the few and the many. The first are the rich and well born, the other the mass of the people. The voice of the people has been said to be the voice of God; and however generally this maxim has been quoted and believed, it is not true in fact. The people are turbulent and changing; they seldom judge or determine right. Give therefore to the first class a distinct, permanent share in the government. They will check the unsteadiness of the second, and as they cannot receive any advantage by a change, they therefore will ever maintain good government. Can a democratic assembly, who annually revolve in the mass of the people, be supposed steadily to pursue the public good? Nothing but a permanent body can check the imprudence of democracy. Their turbulent and uncontroling disposition requires checks. The first area of major dispute was the manner by which the lower house would be apportioned. A minority wanted it to be apportioned so that all states would have equal weight, though this was never seriously considered. Most wanted it apportioned in accordance with some mixture of property and population. :117 Though there was discussion on how to calculate property for this purpose, the issue of property was later dropped because of its difficulty, and an assumption that property would closely correlate to population. At the time of the Convention, they noted that local newspapers said little of current events, and what little they had was sketchy and dated. Local papers even said little about the meeting of the Convention. Alexander Hamilton proposed extending the term in office for senators to life, considering earlier proposals of four and seven years inefficient to enable the "rich and well born" to have a "distinct, permanent share in the government," which could "check the imprudence of democracy." Moreover, Hamilton proposed that senators not be elected directly by the general public, but by "electors" chosen for that purpose. Besides the problems of direct election, the new Constitution was seen as such a radical break with the old system, by which delegates were elected to the Confederation Congress by state legislatures, that the Convention agreed to retain this method of electing senators to make the constitutional change less radical. :122 The more difficult problem was the issue of apportionment. The Connecticut delegation offered a compromise, whereby the number of representatives for each state in the lower house would be apportioned based on the relative size of the state's population, while the number of representatives in the upper house would be the same for all of the states, irrespective of size. The large states, fearing a diminution of their influence in the legislature under this plan, opposed this proposal. Unable to reach agreement, the delegates decided to leave this issue for further consideration later during the meeting. The delegates couldn't agree on whether the executive should be a single person, or a board of three. Many wished to limit the power of the executive and thus supported the proposal to divide the executive power between three persons. :134 The possible problems of this system, in addition to the knowledge that George Washington would probably be the first president, calmed the fears enough so that the proponents of a singular executive could accumulate a large coalition. :134 This issue came up occasionally after the matter was settled, but was never again seriously doubted. The Convention adjourned from July 26 to August 6 to await the report of the Committee of Detail, which was to produce a first draft of the Constitution. It was chaired by John Rutledge, with the other members including Edmund Randolph, Oliver Ellsworth, James Wilson, and Nathaniel Gorham. Much of what was included in the committee's report consisted of numerous details that the Convention had never discussed but which the committee correctly viewed as uncontroversial and unlikely to be challenged; and as such, much of the committee's proposal would ultimately be incorporated into the final version of the Constitution without debate. :169 Examples of these details included the Speech and Debate Clause, which grants members of Congress immunity for comments made in their jobs, and the rules for organizing the House of Representatives and the Senate. John Rutledge, a judge and former governor of South Carolina, chaired the committee that wrote the first draft of the Constitution. He argued for a federal government of limited power. The final report of the committee, which became the first draft of the Constitution, was the first workable constitutional plan, as Madison's Virginia Plan had simply been an outline of goals and a broad structure. Even after it issued this report, the committee continued to meet off and on until early September. Another month of discussion and relatively minor refinement followed, during which several attempts were made to alter the Rutledge draft, though few were successful. Some wanted to add property qualifications for people to hold office, while others wanted to prevent the national government from issuing paper money. :187 Madison in particular wanted to push the Constitution back in the direction of his Virginia plan. Once the Convention had finished amending the first draft from the Committee of Detail, a new set of unresolved questions were sent to several different committees for resolution. The Committee of Detail was considering several questions related to habeas corpus, freedom of the press, and an executive council to advise the president. Two committees addressed questions related to the slave trade and the assumption of war debts. A new committee was created, the Committee on Postponed Parts, to address other questions that had been postponed. Its members, such as Madison, were delegates who had shown a greater desire for compromise and were chosen for this reason as most in the Convention wanted to finish their work and go home. :207 The committee dealt with questions related to the taxes, war making, patents and copyrights, relations with indigenous tribes, and Franklin's compromise to require money bills to originate in the House. The biggest issue they addressed was the presidency, and the final compromise was written by Madison with the committee's input. :209 They adopted Wilson's earlier plan for choosing the president by an electoral college, and settled on the method of choosing the president if no candidate had an electoral college majority, which many such as Madison thought would be "nineteen times out of twenty". The committee also shortened the president's term from seven years to four years, freed the president to seek re-election after an initial term, and moved impeachment trials from the courts to the Senate. They also created the office of the vice president, whose only roles were to succeed a president unable to complete a term of office, to preside over the Senate, and to cast tie-breaking votes in the Senate. The committee transferred important powers from the Senate to the president, for example the power to make treaties and appoint ambassadors. :212 One controversial issue throughout much of the Convention had been the length of the president's term, and whether the president was to be term limited. The problem had resulted from the understanding that the president would be chosen by Congress; the decision to have the president be chosen instead by an electoral college reduced the chance of the president becoming beholden to Congress, so a shorter term with eligibility for re-election became a viable option. Near the end of the Convention, Gerry, Randolph, and Mason emerged as the main force of opposition. Their fears were increased as the Convention moved from Madison's vague Virginia Plan to the concrete plan of Rutledge's Committee of Detail. :235 Some have argued that Randolph's attacks on the Constitution were motivated by political ambition, in particular his anticipation of possibly facing rival Patrick Henry in a future election. The main objection of the three was the compromise that would allow Congress to pass "navigation acts" with a simple majority in exchange for strengthened slave provisions. :236 Among their other objections was an opposition to the office of vice president. Though most of their complaints did not result in changes, a couple did. Mason succeeded in adding "high crimes and misdemeanors" to the impeachment clause. Gerry also convinced the Convention to include a second method for ratification of amendments. The report out of the Committee of Detail had included only one mechanism for constitutional amendment, in which two-thirds of the states had to ask Congress to convene a convention for consideration of amendments. Upon Gerry's urging, the Convention added back the Virginia Plan's original method whereby Congress would propose amendments that the states would then ratify. :238 All amendments to the Constitution, save the 21st amendment, have been made through this latter method. Gouverneur Morris is credited, both now and then, as the chief draftsman of the final document, including the stirring preamble. Not all the delegates were pleased with the results; thirteen left before the ceremony, and three of those remaining refused to sign: Edmund Randolph of Virginia, George Mason of Virginia, and Elbridge Gerry of Massachusetts. George Mason demanded a Bill of Rights if he was to support the Constitution. The Bill of Rights was not included in the Constitution submitted to the states for ratification, but many states ratified the Constitution with the understanding that a bill of rights would soon follow. Shortly before the document was to be signed, Gorham proposed to lower the size of congressional districts from 40,000 to 30,000 citizens. A similar measure had been proposed earlier, and failed by one vote. George Washington spoke up here, making his only substantive contribution to the text of the Constitution in supporting this move. The Convention adopted it without further debate. Gorham would sign the document, although he had openly doubted whether the United States would remain a single, unified nation for more than 150 years. :112 Ultimately, 39 of the original 55 delegates ended up signing, but it is likely that none were completely satisfied. Their views were summed up by Benjamin Franklin, who said, "I confess that There are several parts of this Constitution which I do not at present approve, but I am not sure I shall never approve them. ... I doubt too whether any other Convention we can obtain, may be able to make a better Constitution. ... It therefore astonishes me, Sir, to find this system approaching so near to perfection as it does; and I think it will astonish our enemies ..."
Rhode Island never sent delegates, and two of New York's three delegates did not stay at the Convention for long. Therefore, as George Washington stated, the document was executed by "eleven states, and Colonel Hamilton. ":244 Washington signed the document first, and then moving by state delegation from north to south, as had been the custom throughout the Convention, the delegates filed to the front of the room to sign their names. Whilst the last members were signing it Doctor. Franklin looking towards the Presidents Chair, at the back of which a rising sun happened to be painted, observed to a few members near him, that Painters had found it difficult to distinguish in their art a rising from a setting sun. I have said he, often and often in the course of the Session, and the vicissitudes of my hopes and fears as to its issue, looked at that behind the President without being able to tell whether it was rising or setting: But now at length I have the happiness to know that it is a rising and not a setting Sun. The Constitution was then submitted to the states for ratification, pursuant to its own Article VII. Prior to the start of the Convention, the Virginian delegates met and, drawing largely from Madison's suggestions, came up with what came to be known as the Virginia Plan, also known as the Large State Plan. For this reason, James Madison is sometimes called the Father of the Constitution. Presented by Virginia governor Edmund Randolph on May 29, 1787, the Virginia Plan proposed a very powerful bicameral legislature. Both houses of the legislature would be determined proportionately. The lower house would be elected by the people, and the upper house would be elected by the lower house. The executive would exist solely to ensure that the will of the legislature was carried out and would therefore be selected by the legislature. The Virginia Plan also created a judiciary, and gave both the executive and some of the judiciary the power to veto, subject to override. After the Virginia Plan was introduced, New Jersey delegate William Paterson asked for an adjournment to contemplate the Plan. Under the Articles of Confederation, each state had equal representation in Congress, exercising one vote each. The Virginia Plan threatened to limit the smaller states' power by making both houses of the legislature proportionate to population. On June 14 and 15, 1787, a small-state caucus met to create a response to the Virginia Plan. The result was the New Jersey Plan, otherwise known as the Small State Plan. Paterson's New Jersey Plan was ultimately a rebuttal to the Virginia Plan, and was much closer to the initial call for the Convention: drafting amendments to the Articles of Confederation to fix the problems in it. Under the New Jersey Plan, the existing Continental Congress would remain, but it would be granted new powers, such as the power to levy taxes and force their collection. An executive branch was created, to be elected by Congress (the plan allowed for a multi-person executive). The executives would serve a single term and were subject to recall on the request of state governors. The plan also created a judiciary that would serve for life, to be appointed by the executives. Lastly, any laws set by Congress would take precedence over state laws. When Paterson reported the plan to the Convention on June 15, 1787, it was ultimately rejected, but it gave the smaller states a rallying point for their interests. Unsatisfied with the New Jersey Plan and the Virginia Plan, Alexander Hamilton proposed his own plan. It also was known as the British Plan, because of its resemblance to the British system of strong centralized government. In his plan, Hamilton advocated virtually doing away with state sovereignty and consolidating the states into a single nation. The plan featured a bicameral legislature, the lower house elected by the people every three years. The upper house would be elected by electors chosen by the people and would serve for life. The plan also gave the Governor, an executive elected by electors for a life-term of service, an absolute veto over bills. State governors would be appointed by the national legislature, and the national legislature had veto power over any state legislation. Hamilton presented his plan to the Convention on June 18, 1787. The plan was perceived as a well-thought-out plan, but it was not considered, because it resembled the British system too closely. It also contemplated the loss of most state authority, which the states were unwilling to allow. Immediately after Randolph finished laying out the Virginia Plan, Charles Pinckney of South Carolina presented his own plan to the Convention. As Pinckney did not write it down, the only evidence of the plan are Madison's notes, so the details are somewhat vague. It was a confederation, or treaty, among the thirteen states. There was to be a bicameral legislature made up of a Senate and a House of Delegates. The House would have one member for every one thousand inhabitants. The House would elect Senators who would serve by rotation for four years and represent one of four regions. Congress would meet in a joint session to elect a President, and would also appoint members of the cabinet. Congress, in joint session, would serve as the court of appeal of last resort in disputes between states. Pinckney did also provide for a supreme Federal Judicial Court. The Pinckney plan was not debated, but it may have been referred to by the Committee of Detail. The Connecticut Compromise, forged by Roger Sherman from Connecticut, was proposed on June 11. In a sense it blended the Virginia (large-state) and New Jersey (small-state) proposals. Ultimately, however, its main contribution was in determining the apportionment of the Senate, and thus retaining a federal character in the constitution. Sherman sided with the two-house national legislature of the Virginia Plan, but proposed "That the proportion of suffrage in the 1st. 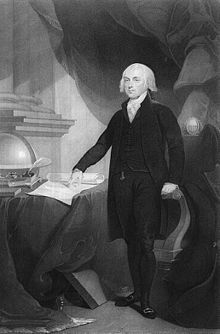 branch [house] should be according to the respective numbers of free inhabitants; and that in the second branch or Senate, each State should have one vote and no more." This plan failed at first, but on July 23 the question was finally settled. What was ultimately included in the constitution was a modified form of this plan. In the Grand Committee, Benjamin Franklin successfully proposed the requirement that revenue bills originate in the house. But the final July 16 vote on the compromise still left the Senate looking like the Confederation Congress. In the preceding weeks of debate, Madison, King, and Gouverneur Morris each vigorously opposed the compromise for this reason. Then on July 23, just before most of the convention's work was referred to the Committee of Detail, Morris and King moved that state representatives in the Senate be given individual votes, rather than voting en bloc, as they had in the Confederation Congress. Oliver Ellsworth of Connecticut, a leading proponent of the compromise, supported their motion, and the Convention adopted it. As the personally powerful senators were to receive terms much longer than the state legislators who appointed them, they became substantially independent. The compromise nonetheless continued to serve the self-interest of small-state political leaders, who were assured of access to more seats in the Senate than they might otherwise have obtained. Among the most controversial issues confronting the delegates was that of slavery. Slavery was widespread in the states at the time of the Convention. :68 At least a third of the Convention's 55 delegates owned slaves, including all of the delegates from Virginia and South Carolina. :68–69 Slaves comprised approximately one-fifth of the population of the states;:139 and apart from northernmost New England, where slavery had largely been eliminated, slaves lived throughout all regions of the country. :132 The majority of the slaves (more than 90%),:132 however, lived in the South, where approximately 1 in 3 families owned slaves (in the largest and wealthiest state, Virginia, that figure was nearly 1 in 2 families). :135 The entire agrarian economy of the South was based on slave labor, and the Southern delegates to the Convention were unwilling to accept any proposals that they believed would threaten the institution. Quaker John Dickinson argued forcefully against slavery during the Convention. Once Delaware's largest slaveholder, he had freed all of his slaves by 1787. Another contentious slavery-related question was whether slaves would be counted as part of the population in determining representation of the states in the Congress, or would instead be considered property and as such not be considered for purposes of representation. Delegates from states with a large population of slaves argued that slaves should be considered persons in determining representation, but as property if the new government were to levy taxes on the states on the basis of population. Delegates from states where slavery had become rare argued that slaves should be included in taxation, but not in determining representation. Finally, delegate James Wilson proposed the Three-Fifths Compromise. This was eventually adopted by the Convention. Fifty-five delegates attended sessions of the Constitutional Convention, and are considered the Framers of the Constitution, although only 39 delegates actually signed. The states had originally appointed 70 representatives to the Convention, but a number of the appointees did not accept or could not attend, leaving 55 who would ultimately craft the Constitution. Almost all of the 55 Framers had taken part in the Revolution, with at least 29 having served in the Continental forces, most in positions of command. All but two or three had served in colonial or state government during their careers. :65 The vast majority (about 75%) of the delegates were or had been members of the Confederation Congress, and many had been members of the Continental Congress during the Revolution. :25 Several had been state governors. :65 Just two delegates, Roger Sherman and Robert Morris, would be signatories to all three of the nation's founding documents: the Declaration of Independence, the Articles of Confederation, and the Constitution. More than half of the delegates had trained as lawyers (several had even been judges), although only about a quarter had practiced law as their principal means of business. There were also merchants, manufacturers, shippers, land speculators, bankers or financiers, two or three physicians, a minister, and several small farmers. :65–68 Of the 25 who owned slaves, 16 depended on slave labor to run the plantations or other businesses that formed the mainstay of their income. Most of the delegates were landowners with substantial holdings, and most, with the possible exception of Roger Sherman and William Few, were very comfortably wealthy. :66–67 George Washington and Robert Morris were among the wealthiest men in the entire country. Their depth of knowledge and experience in self-government was remarkable. As Thomas Jefferson in Paris semi-seriously wrote to John Adams in London, "It really is an assembly of demigods." Delegates used two streams of intellectual tradition,[clarification needed] and any one delegate could be found using both or a mixture depending on the subject under discussion: foreign affairs, the economy, national government, or federal relationships among the states. Rhode Island did not send delegates to the Convention. (*) Did not sign the final draft of the U.S. Constitution. Randolph, Mason, and Gerry were the only three present in Philadelphia at the time who refused to sign. Several prominent Founders are notable for not participating in the Constitutional Convention. Thomas Jefferson was abroad, serving as the minister to France. :13 John Adams was in Britain, serving as minister to that country, but he wrote home to encourage the delegates. Patrick Henry refused to participate because he "smelt a rat in Philadelphia, tending toward the monarchy." Also absent were John Hancock and Samuel Adams. Many of the states' older and more experienced leaders may have simply been too busy with the local affairs of their states to attend the Convention,:65 which had originally been planned to strengthen the existing Articles of Confederation, not to write a constitution for a completely new national government. The 1989 film A More Perfect Union, which portrays the events and discussions of the Constitutional Convention, was largely filmed in Independence Hall. In the 2015 Broadway musical Hamilton, Alexander Hamilton's proposal of his own plan during the Constitutional Convention was featured in the song "Non-Stop", which concluded the first act. ^ Manasseh Cutler was a Congregationalists minister and former Army chaplain from Massachusetts. He arrived directly from lobbying success in New York City during the Northwest Ordinance negotiations at the Articles Congress. ^ a b c Jillson, Calvin C. (2009). American Government: Political Development and Institutional Change (5th ed.). Taylor & Francis. ISBN 978-0-203-88702-8. ^ Odesser-Torpey, Marilyn (2013). Insiders' Guide to Philadelphia & Pennsylvania Dutch Country. Morris Book Publishing, LLC. p. 26. ISBN 9780762756995. Retrieved November 10, 2015. ^ Rossiter, Clinton (1987). 1787: The Grand Convention. W.W. Norton. ISBN 978-0-393-30404-6. Retrieved November 10, 2015. ^ U.S. Census Bureau (2017). "Pop Culture: 1790". History: Fast Facts. Archived from the original on October 9, 2017. ^ a b c d e f g Larson, Edward J.; Winship, Michael P. (2005). The Constitutional Convention: A Narrative History from the Notes of James Madison. New York: The Modern Library. ISBN 0-8129-7517-0. ^ a b c d e f g h i j k l m n o p q r s t u v w x y z aa ab ac ad ae af ag ah ai aj ak al am an ao ap aq Beeman, Richard (2009). Plain Honest Men: The Making of the American Constitution. New York: Random House. ISBN 978-1-4000-6570-7. ^ a b Articles of Confederation, Art. 13. ^ Hunt, Gaillard (1902). The Life of James Madison. Doubleday. ^ Richards, Leonard (2003). Shays's Rebellion:The American Revolution's Final Battle. Philadelphia: University of Pennsylvania Press. pp. 132–139. ISBN 978-0-8122-1870-1. ^ a b c d Padover, Saul K. (1995). Landynski, Jacob W. (ed.). The Living U.S. Constitution: Historical Background, Landmark Supreme Court Decisions, with Introductions, Indexed Guide, Pen Portraits of the Signers (3rd rev. ed.). New York: Meridian. ISBN 978-0452011472. ^ Irons, Lee., The 1788 American Revision of the Westminster Standards, viewed September 15, 2011. Referencing "Records of the Presbyterian Church in the United States of America 1706–1788" (1969). ^ Bowen 2010, p. 22. ^ Bowen 2010, pp. 19–20, 37, 173–76, 216–17. ^ Bowen 2010, pp. 37, 173–76, 216–17. ^ Teaching American History.org, A citizen of America: an examination into the leading principles of America, viewed October 20, 2011. Scudder, Horace Elisha. Noah Webster, 1885 ed., p. 129. ^ Farrand, Max, ed. (1911). The Records of the Federal Convention of 1787, Volume 1. New Haven: Yale University Press. p. 155. ^ a b Farrand, Max, ed. (1911). The Records of the Federal Convention of 1787, Volume 2. New Haven: Yale University Press. pp. 94–95. ^ a b c d e f g h i j k l m n o p q r s t u v w x y z aa ab ac Stewart, David O. (2007). The Summer of 1787. New York: Simon & Schuster. ISBN 978-0-7432-8692-3. ^ National Archives. "Bill of Rights". Retrieved March 7, 2016. ^ a b "Rising Sun" in The Constitutional Convention of 1787: A Comprehensive Encyclopedia of America's Founding, Vol. 1 (ed. John R. Vile: ABC-CLIO, 2005), p. 681. ^ Madison Notes for September 17, 1787. ^ Akhil Reed Amar (2006). America's Constitution: A Biography. Random House Digital, Inc. p. 29. ISBN 978-0-8129-7272-6. ^ a b c d e f g h i j k l m n o p q r s t u v w x y z aa ab US Constitution.net. "Constitutional Topic: The Constitutional Convention". Retrieved October 17, 2007. ^ The Debates in the Federal Convention of 1787 reported by James Madison : May 29. "The Avalon Project at Yale Law School". Archived from the original on August 15, 2017. Retrieved August 19, 2017. ^ Farrand, Max, ed. (1911). The Records of the Federal Convention of 1787, Volume 1. New Haven: Yale University Press. pp. 489, 490, 551. ^ a b c d United States Department of Labor and Commerce Bureau of the Census (1909). A Century of Population Growth: From the First Census of the United States to the Twelfth, 1790–1900. D.C.: Government Printing Office. ^ a b c Constitutional Rights Foundation. "The Constitution and Slavery". Archived from the original on February 25, 2004. Retrieved September 15, 2016. ^ a b "Meet the Framers of the Constitution". America's Founding Documents. U.S. National Archives and Records Administration. 2017. Archived from the original on August 27, 2017. ^ Rodell, Fred (1986). 55 Men: The Story of the Constitution, Based on the Day-by-Day Notes of James Madison. Stackpole Books. p. 4. ISBN 978-0-8117-4409-6. ^ a b c d e "The Founding Fathers: A Brief Overview". The Charters of Freedom. U.S. National Archives and Records Administration. Archived from the original on October 6, 2016. ^ Webb, Derek A. "Doubting a little of one's infallibility: The real miracle at Philadelphia - National Constitution Center". National Constitution Center – constitutioncenter.org. Retrieved October 15, 2018. ^ Jefferson, Thomas. "Letter of Thomas Jefferson to John Adams, August 30, 1787". The Library of Congress. Retrieved October 15, 2018. ^ Farrand, Max (1913). The Framing of the Constitution of the United States. New Haven: Yale University Press. Beeman, Richard (2009). Plain Honest Men: The Making of the American Constitution. New York: Random House. ISBN 978-1-4000-6570-7. Farrand, Max (1913). The Framing of the Constitution of the United States. New Haven: Yale University Press. Hunt, Gaillard (1902). The Life of James Madison. Doubleday. Jillson, Calvin C. (2009). American Government: Political Development and Institutional Change (5th ed.). Taylor & Francis. ISBN 978-0-203-88702-8. Larson, Edward J.; Winship, Michael P. (2005). The Constitutional Convention: A Narrative History from the Notes of James Madison. New York: The Modern Library. ISBN 0-8129-7517-0. Stewart, David O. (2007). The Summer of 1787. New York: Simon & Schuster. ISBN 978-0-7432-8692-3. United States Department of Labor and Commerce Bureau of the Census (1909). A Century of Population Growth: From the First Census of the United States to the Twelfth, 1790–1900. Washington, D.C.: Government Printing Office. Wikimedia Commons has media related to Constitutional Convention (United States). This page was last edited on 6 April 2019, at 04:26 (UTC).